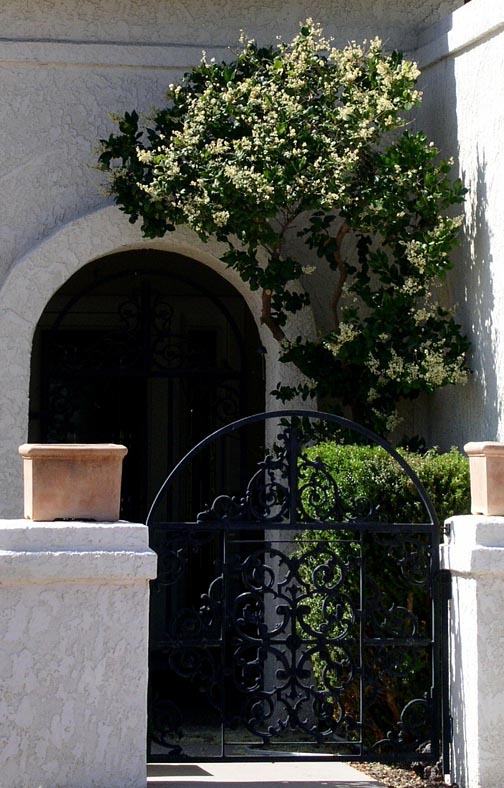 Landscape Use: Informal hedge plant, background, screen, small multiple-trunk patio tree, filler plant, containers, accent. Form & Character: Evergreen, old fashioned, formal, dense, rounded, to upright shrub for mesic landscape designs. Growth Habit: Moderately upright and rounded to 15 feet with equal spread. Can be maintained at 5 to 6 feet. Foliage/Texture: Leaves are thick, glabrous, waxy, ovate and slightly recurved downward toward the apical tip, opposite, to 4 inches long, prominent mid vein, prominent stem lenticels; medium texture. Flowers & Fruits: Musty smelling small white flowers in panicled clusters, fruits small black, waxy globose to 1/4 inch long, clustered. Seasonal Color: White flowers in late spring (usually May). Temperature: Tolerant of Phoenix cold. Light: Partial sun best. Avoid western sun. Soil: Some chlorosis in wet alkaline soils, well drained. Pruning: Best pruned in early to mid summer after bloom. Can be pruned in any manner. Sometimes sheared as large topiary. Disease and pests: Root rot pathogens, especially Texas root rot, scale, spider mites. Additional comments: A good large filler plant for mesic landscapes. 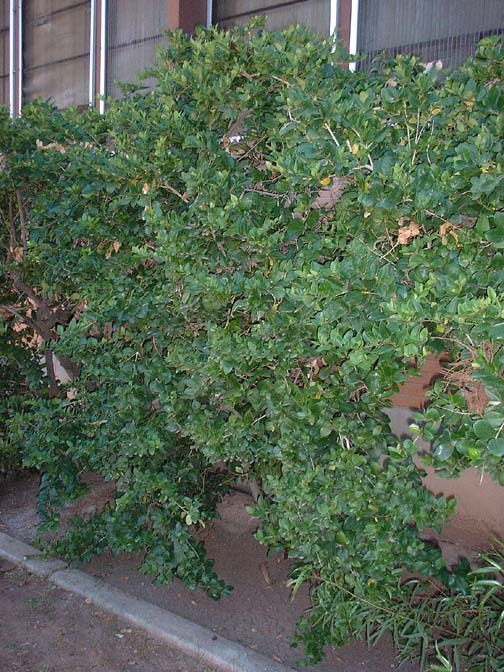 In Phoenix, this large shrub is an old-fashioned plant. It is widely used across the southern half of the United States from the Pacific to the Atlantic Oceans. 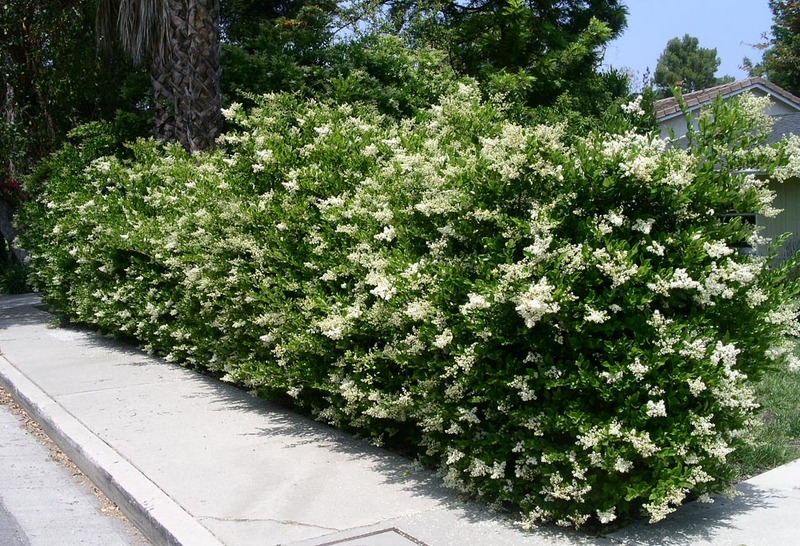 Japanese privet has many named cultivars and is often confused with L. ovalifolium. .